A few years ago, I went into the bookstore looking for a book, and not having any idea of what I wanted to pick. I went to the recommended section, and picked up Carlos Ruiz Zafon’s The Shadow of the Wind. I liked the look of it, so I bought it, took it home, and spent the next two days doing nothing but reading. The Shadow of the Wind is my favourite adult novel, and my second favourite novel all-around (2nd, of course, to Peter Pan and Wendy). So when I went into the bookstore last summer, with no intention of actually getting a book, and saw that Zafon had a new book released here, I had to get it. So started my lengthy adventure with The Angel’s Game. The Angel’s Game is not a prequel to The Shadow of the Wind, but it takes place before it, and involves characters who ultimately become Daniel’s parents. The story revolves, however, around another character, David Martin, who is a writer, commissioned to write a new religion for a mysterious figure often referred to as The Boss. What ensures is a dark, powerful, and frightening journey through a sinister Barcelona that is filled with murderous secrets and a tendency for madness. 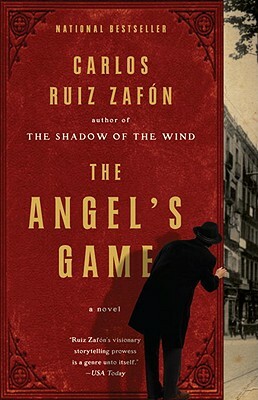 I began reading The Angel’s Game, and was again drawn in by the beauty of Zafon’s writing, as well as the passion for books and literature that also filled The Shadow of the Wind; I was also thrilled to see another appearance of The Cemetery of Forgotten Books. After about 280 pages, however (more or less half way through the book), I came to discover that I could not stand the character of David. Don’t get me wrong; the writing was as powerful as ever, and the general story was intriguing, but David, and his obsession with Cristina, was so much of an annoyance to me that I had to stop reading. So I did, for nearly a year. Then, about a week ago, I decided to pick up where I left off, and give it another go. I had had enough time to let my emotions simmer, and I was able to finish the story; the ultimate ending I was not too keen on, although I appreciated the disturbing twist on it, and overall I was quite happy to have the book finally finished.